Relieve your favourite concert at home with a speaker that adjusts to the acoustics in any room to deliver impeccable sound. PLAY:3 delivers, in stereo. Three Class-D amplifiers and three custom-built drivers create a full, wide sound stage so the instruments and vocals shine. Trueplay tuning analyzes the room then adjusts your PLAY:3 to deliver the best sound possible. For both music and home theatre. Stand it tall or set it on its side. Either way, PLAY:3 automatically optimizes the sound. With Sonos, the songs stream from your Wi-Fi network so there are never any dropouts, delays or interruptions. Choose what to play, where to play it, and how loud you want it. Stream your music in one room, or all over your home. Track down songs across all your music services with a single search. Just download the app for everyone in your home so you can all set up Sonos and start streaming. 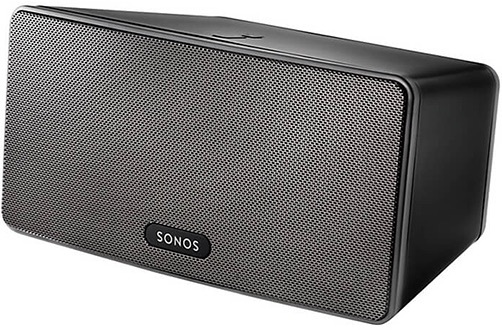 Sonos works with most Apple or Android devices. Program your entire home audio experience, room by room, from your mobile phone. Connect directly to your home's Wi-Fi network through the Sonos App. 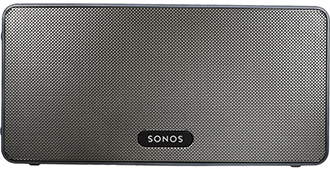 Learn why the Sonos PLAY:3 is a versatile speaker that creates wall-to-wall sound.